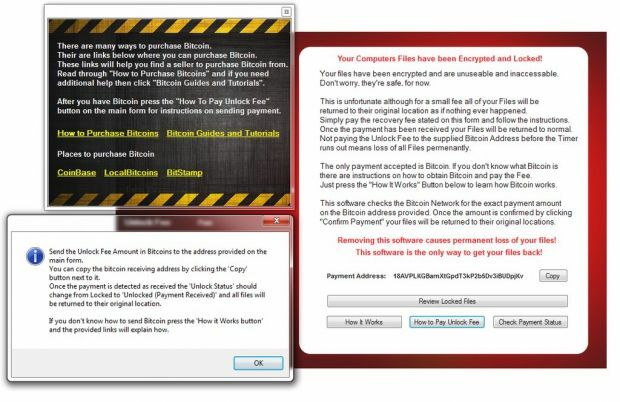 A new ransomware strain called CryptoHost was discovered, which claims that it encrypts your data and then demands a ransom of .33 bitcoins to get your files back (~140 USD at the current exchange rate) . These cybercrims took a shortcut though, your files are not encrypted but copied into a password protected RAR archive. They are also not very professional compared to other crypto-ransomware threat actors and the password created by this infection is relatively easily discovered so that you can get infected workstations recovered if there is no backup. The bleepingcomputer blog has all the instructions on how to do this in greater detail. However, with any malware infection these days you do not know what other evil code is laid down on disk. Either run MalwareBytes to find it all and remove it, or wipe the machine and rebuild; it's better to be safe than sorry.